A few simple tips can help your turkey come out perfectly. 1. Brine your turkey. 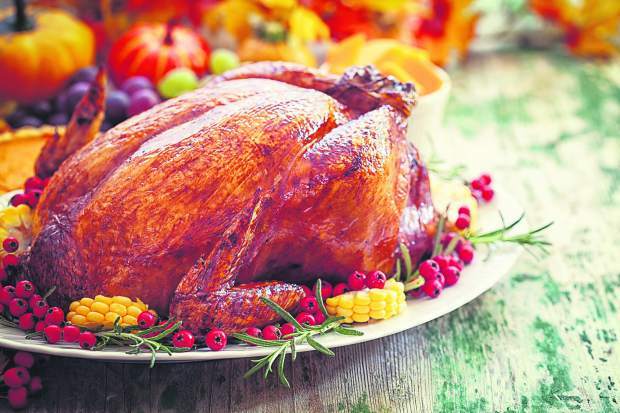 Payling suggests brining the turkey whether using a whole bird or just parts of it. It makes a big difference in making the bird more tender, and it doesn’t take a lot of time. Brining kits can be purchased or made at home. To make the brine, use a large enough container for the size of the bird, and use a two-to-one salt to sugar ratio, he said. Mix that with water, cover the bird and let it sit overnight, or for 12 hours. 2. Let the bird warm up to room temperature. After brining, Paling said to pat the bird dry and let it sit out on the counter until it comes to room temperature before putting it in the oven. This usually takes about an hour or two, until the temperature is above 38 degrees. 3. Season and stuff. Season the bird to taste with salt, pepper and a poultry blend, which can include thyme, sage and rosemary. Payling said to be liberal with the salt and pepper on the outside and, if not stuffing the bird, to season the cavity of the bird. If stuffing, make sure the stuffing is warm so it cooks all the way through. 4. Cook. Preheat the oven between 350 degrees and 400 degrees. Start at a hotter temperature, let it cook for about an hour, and then lower the temperature for the rest of the cook time. The amount of time the bird takes depends on the oven, where you live and how big the bird is. Payling said the “minute per pound” rule is vague, and he said the best way to tell when the turkey is done is through internal temperature. Pull the bird out when the internal temperature is roughly 160 degrees, and let it sit on the counter for at least 15 minutes before serving. To take the temperature, push the thermometer in the bird between the leg and into the breast meat, as far as it goes before touching bone. High altitude can increase cooking time. Expertly prepared side dishes can steal the show. Stephanie McCubbin, marketing and community relations for Whole Foods, said the best way to make sure your dinner comes together is having a plan. She likes to write out everything she is preparing and plan oven and counter space. She said serving side dishes that are different temperatures, textures and flavors will enhance the meal. Here are a few less-traditional Thanksgiving side dish recipes from Whole Foods. This dish combines quinoa with the flavor combination of sweet pears, tart pomegranate seeds and peppery watercress. McCubbin said she likes this dish because it is super healthy, but you can’t tell by looking at it or by its taste. It adds nice holiday color to the table and can be served hot or cold. Combine 2 cups water and quinoa in a medium saucepan, and bring to a boil. Reduce heat to a simmer, cover, and cook until quinoa is tender and all water is absorbed, 15 to 20 minutes. Place quinoa in a large bowl with watercress, pears, pomegranate seeds, walnuts, juice and vinegar. Stir to combine, and then serve. Spicy poblano peppers join red and green bell peppers to add zing and flavor to this recipe. If your cornbread is extremely fresh, allow it to dry out a bit before using. For a gluten-free version, use gluten-free cornbread, or for a dairy-free version, use non-hydrogenated, non-dairy margarine in place of the butter. Preheat the oven to 350 degrees. Butter a 9-inch-by-13-inch baking dish; set aside. Heat butter in a large skillet over medium-high heat. Add poblano and bell peppers, and cook, stirring occasionally, until just golden and tender. Add onions and 1 bag of corn, and continue cooking until onions are translucent, about 5 minutes. Set aside to let cool, and then drain some of the liquid if too wet. Meanwhile, pulse remaining bag of corn in a food processor with eggs, maple syrup, salt and pepper until well combined and almost smooth. In a large bowl, combine cooled pepper mixture with corn mixture, and then gradually fold in cornbread. Do not over mix; stuffing should have a coarse texture. Transfer to the prepared dish, and cover with parchment paper and then snugly with foil and bake for 40 minutes. Uncover, and bake until golden brown on top, about 15 minutes more.